The National Theatre of Scotland and Catherine Wheels have come together to produce Ray Bradbury's adaptation of his own novel, and with some very strong press reviews and an audience response at the curtain call to match, you'd expect to be reading a very positive post from us. I certainly expected to be writing one. But I'm genuinely sorry to report that this left us cold. We had significant difficulties engaging with the show. It's. Just. So. Dreadfully. Slow. Elements which take up a good deal of stage time (such as the Lightning Rod Salesman and Most Beautiful Woman in the World) may be significant in the novel but here the pay-offs simply don't justify the time spent on them. Yet, unless I blinked and missed it the fate of Will's mother was never resolved but the boys seem to run happily home without further thought. 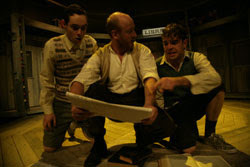 The other major difficulty is caused by the 'oversize' casting of the two young characters of Jim & Will (Patrick Mulvey & Michael Gray). By going with performers so far beyond the (almost) 14 years of the characters, combined with the wholesome fifties dialogue it's difficult not to find oneself thinking in terms of the Comic Strip's "Five Go Mad in Dorset". It just made it too hard to suspend disbelief in a coming-of-age story. Further flaws include the failure to even attempt to reduce the visibility of the harness for the admittedly impressive aerial work by Jennifer Paterson; having the equally impressive Jonothan Campbell acting as counterbalance in full view of the audience at the side of the set (fascinating but hugely distracting); a closing song that seems dreadfully out of place; and live musicians that may as well have been recorded. To be fair it did a very impressive job of keeping the attention of the large number of young people in the audience. Waldorf feels we needed to channel our inner child and then perhaps it would have worked better for us, but I'm not convinced. However, there are elements that worked - even for us. Andrew Clark gives a suitably Dark and dangerous performance while Graham Kent impresses as Will's father, as does Antony Eden as Cooger. The video/projection elements are wonderfully done and the carousel and mirror maze scenes are striking. But, what do we know... the closest feeling I have had to seeing this show was our disappointment at "Peer Gynt" - which went on to win numerous awards. Something Wicked This Way Comes has now completed its run. Image by Douglas McBride used with permission.